I've been to the Marktplatz Istanbul for two years in a row now. It's one of those festivals that we first stumbled upon by accident on one of our walks downtown, discovered the food and entertainment were awesome, and then made sure to look out for it every year. There was a modest crowd, but plenty of seating around lunchtime on Sunday. This year, we decided to go on Sunday, the day the market opened, and met some of my coworkers. We were there at around 12:30 to eat lunch, but discovered that they were still setting up. No matter -- we grabbed some drinks and waited a bit at the picnic tables until the food stalls were ready for us. It was nice because there was hardly anyone there (unlike our trip last weekend to the Stuttgart Street Food Market), and right when they opened up the food stands, we were the first in line. We started with a spinach-stuffed phyllo bread stick from a bakery as we walked around and scouted out our options. The bread was light and flaky, and the spinach savory without being overwhelming. We also picked up some Ali-branded soda drinks. My friend went for the cola, while I picked up the gazoz flavor. The man at the counter said it was like a sweet lemon flavor, but I think it tasted more like a sweet melon, though not exactly. It's one of those flavors that's hard to describe for me, because I'm not sure that one exists like it in the States. For example, it would be like trying to describe the taste of Mountain Dew to someone because I don't know of something in Germany to compare it to. Either way, the flavor was light and refreshing. The sayings on the back of our cola bottles -- "Put an end to excuses for integration" and "No man is illegal" -- very political! The first full dish that we decided to try were pieces of spicy rolled bulgar in lettuce leaves with a sweet and sour dipping sauce. I'd never seen anything like them, and the stand that ran them were from a restaurant in Ludwigsburg. They were advertised as being vegetarian/vegan, making the festival friendly for all kinds of eaters. The consistency was soft and a bit grainy with the bulgar, while the taste had a slow, mellow spice. They were good, and I don't know that I'd eat them as a meal on their own, but they made a great appetizer. After that we tried a Turkish pizza called lahmacun. The giant piece of flatbread had the shape of a tortilla but with a much lighter consistency. It was topped with the traditional mixture of ground meat and minced veggies, like onions, peppers, and tomatoes, plus other herbs. This version was particularly tasty, in part, I think, because of the team of Turkish women diligently rolling out the homemade dough and popping the finished lahmacun in the oven to bake. I could have watched them work for hours! After that, the giant rotating cow on a spit was done, so Matt hopped up to get us some beef. The meat was tender and juicy, though to be honest, I could have done without it. It reminded me more of roast beef rather than seared meat on a spit, and so it just wasn't what I was expecting or craving that day. That is one giant spit of meat! While he finished the meat, I got some veggies that I spied at a long salad counter in the back. They had tons of stuffed vegetables, grilled vegetables, and various salads. In the end, I settled on fried zucchini patties, a veggie-stuff tomato topped with cheese, a rice-stuffed eggplant, and some dolma (stuffed grape leaves). The zucchini patties were probably my favorite (though I later realized I forgot the tzatziki sauce), with the dolma running a close second. You could see and taste that everything was homemade, and I really enjoyed everything I tried. We later went back for some sigara bouregi (cheese wrapped in fried dough) and some minced meat wrapped in a bulgar crust and fried. The best part was that they were still warm and crispy when we got them. Finally, we were just about full to the brim and ready for dessert. We picked up an assortment of baklava at the same bakery from which we got the spinach pastry. Apparently the bakery -- called Gaziantep Bäckerei -- has a few locations around Stuttgart, so we can purchase some of their baklava even after the market closes. Matt said this was probably the freshest, tastiest baklava that he's ever had, and I tend to agree. We tried one kind with pistachios, another with walnuts, and a third with a kind of thick custard inside that were all delicious. We also tried some kind of churro-like dough that was fried until crispy and then soaked in a sweet syrup somewhere between the taste of honey and rose syrup. We sampled pretty much everything that we wanted to, but we might go back again over the next couple of days for a Turkish kebab or for some of the lovely (and huge!) fish sandwiches that we saw. The food came in decent-sized portions, and most everything was between 1-2€ for a piece or 5€ for a platter (except the beef which turned out to be a bit pricey at 10€). 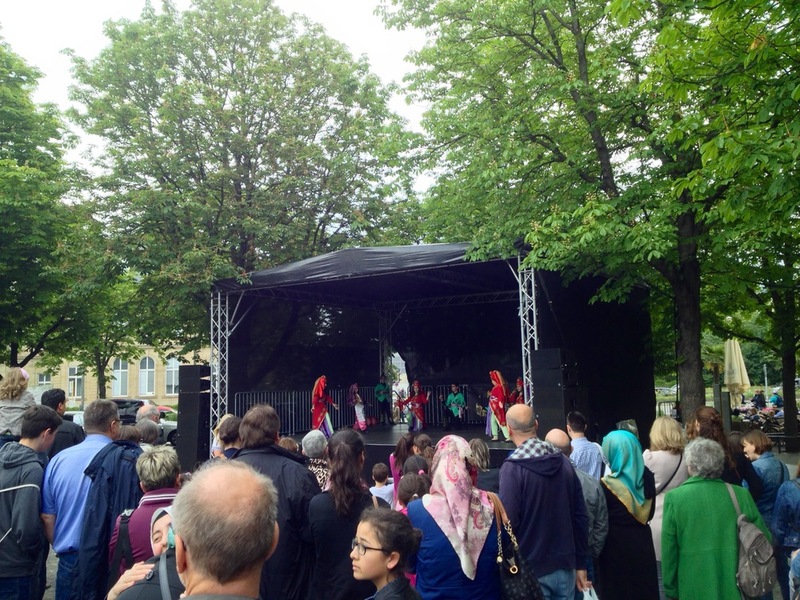 They also have several stalls selling Turkish-style clothing, jewelry, and ceramics, as well as Turkish entertainment including music, dancing, and even fire performers running just about non-stop during the day. What I love most about the Marktplatz Istanbul is the atmosphere. You'll notice in my pictures that the square is filled with tons of families and people enjoying the good food and entertainment. It made a stark contrast to the Vegan Street Day that we swung by afterwards. I thought I'd check out the food there for a blog post, but people were so quiet and somber as a lone man on stage tried to convert the crowd to veganism. And while I don't have anything against being vegan or vegetarian (which I've often thought about trying), I don't like being preached to, and that was the atmosphere there. I much preferred the Marktplatz Istanbul where, ironically, many of the foods were vegetarian, if not vegan, with no preaching, just celebration. So we left and returned to the Marktplatz Istanbul to grab another box of baklava on our way home. The Marktplatz Istanbul is going on now until Wednesday evening. I highly recommend you stop by if you get the chance to try some really excellent Turkish food and soak in the festival atmosphere. The Marktplatz is located in the Karlsplatz between Grand Café Planie and the old castle just off the Charlottenplatz U-bahn station. 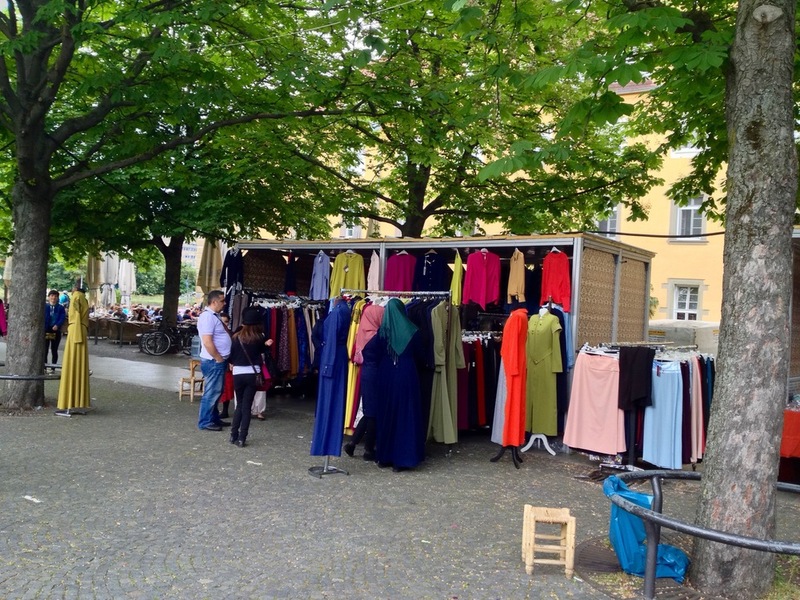 Have you been to the Marktplatz Istanbul? What was your favorite food?